Shiao-Ping's beautiful miches, based on MC's interviews with Gérard Rubaud, inspired me to attempt Rubaud's pain au levain myself. Rubaud's bread is made with 3 very firm levain builds, the final being incorporated in his final dough. He uses a flour mix with 70% AP flour and the remaining 30% a mix of whole wheat, spelt and rye flours. Remarkably, he grinds the flours to feed his levain fresh for each build, and he uses the same flour proportions for each levain build as used in his final dough. Not having a grain mill, I used store-bought flours. I measured out each flour for each build. If I make this bread again, I would make one batch of mixed flour for all the builds and the final dough. This would save time and also be more precise, given the very small amounts of flour in the levain builds. Note that MC's interviews also indicate Rubaud salts his levain builds at 1% of the flour weight, in order to control their speed of ripening. I did not do this. My formula is taken from Shiao-Ping's calculations which were taken from MC's interviews. 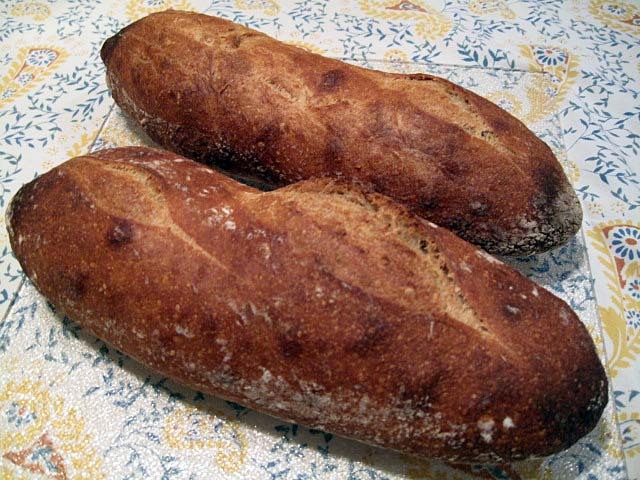 I divided her quantities in half and, rather than a miche, made two smaller (480 gm) bâtards. Rubaud mixes his dough by machine. Shiao-Ping mixed her dough entirely by hand. I started my mixing in a stand mixer, but continued developing the gluten by hand, as described below. The first levain was made with my usual firm sourdough starter which I feed 1:3:4 (starter:water:flour) with a flour mix of 70% AP, 20% Whole wheat and 10% Whole rye flours. To mix each build, dissolve the firm starter in the water in a small bowl. (I use a small dough whisk. ), then add the flours and mix thoroughly into a ball. The first build was fermented for 10 hours, the second and third for about 8 hours each. This was in a cool kitchen, so your times my vary with the activity of your starter and the ambient temperature. Mix the flours and the water. Cover and let it sit to autolyse for 20-60 minutes. Divide the starter into about 6 pieces and add them to the autolyse. Sprinkle the salt over all and mix thoroughly. In a stand mixer, mix with the dough hook on Speed 2 for about 10 minutes. There should be some gluten development, but the dough will be very gloppy. It will not clean the sides of the bowl. Transfer the dough to an oiled bowl. Cover the bowl tightly. After 20 minutes, stretch and fold in the bowl for 30 strokes. Cover the bowl tightly. Repeat Step 5. twice more. Transfer the dough to the board and stretch it to a large rectangle and fold it like an envelope. Replace it in the bowl and cover. After 45 minutes, transfer the dough to a floured board and do another stretch and fold. After another 45 minutes, transfer the dough to the board and divide it into two equal pieces. Pre-shape each piece into a round and let them rest, covered, for 15 minutes. Shape each piece into a bâtard. Proof en couche until expanded by 50-75%. One hour before baking, pre-heat the oven to 500ºF with a baking stone and steaming apparatus in place. When the loaves are ready to bake, pre-steam the oven. Transfer the loaves to a peel. Score them, and then transfer them to the baking stone. Steam the oven again. Turn down the oven to 450ºF. Bake for about 30 minutes, until the internal temperature of the loaves is at least 205ºF, the bottom gives a hollow sound when thumped and the crust is nicely browned. Although I got good gluten development, the dough remained very loose. This was expected, given its high degree of hydration. However, I did not expect how the loaves stuck to the “well-floured” couch and transfer peel. The loaves deflated significantly in the process of transferring them to the Super Peel ™. The latter handled the loaves beautifully in transferring to the stone. No additional sticking. There was very good oven spring, and the cuts on the loaf which didn't stick to the transfer peel as much opened up reasonably well, suggesting that the loaves were not as over-proofed as their deflation on transferring had suggested. By time the bread had cooled, the crust was chewy with just a bit of crunch. (I did not follow my customary practice of drying the loaves in the cooling oven for a few minutes after they are fully baked.) The crumb was very well aerated. It had an aroma that seemed whole-wheaty, yet different. The flavor was excellent – complex and wheaty with some sweetness and more sourdough tang than I expected. Wonderful bread. I want to make it again, but next time I'll flour the couche more heavily. That is a beautiful crumb shot. I must say it looks perfect. As you may have gathered, this was a semi-disaster recovery. I give full credit to the dough. When I saw it spring in the oven, I was sure relieved. The crumb is amazing. The loaves are feather-light, which I find remarkable for a bread with 30% whole grain flour. Shiao-Ping got a very similar crumb and remarked on it. And the flavor is amazing, too. The rye flavor is submerged. I can taste the whole wheat. I haven't baked enough with spelt to identify its flavor tones. Interestingly, there is a bit of the herbal/perfumey flavor I get with white whole wheat. Very complex. I didn't get quite the open structure you did but as you say the flavor notes are remarkable. I had a bag of white ww open so that's what I used. My next batch will include the fresh ground ww from flourgirl51. It's such a sweet flour, I love using it. I have begun using my lined baskets for these boules and miche. (Humm are multiple loaves miche or miches?) I'm actually surprised at how easily the dough falls out in comparison to the coiled or plastic model. I recalled seeing the video of the Polaine baker plopping the miche on the peel in a cloud of dust with a thud. Nothing gentle about it. So I decided to see if I could do the same. My rice flour and AP mix is like Teflon when applied with a brush on the linen and dusted over the dough lightly. My 2.5 # Greek miche proofed for 3 hours (80% hydration) and if I hadn't been quick about plopping it over, it would of rolled out. I'm amazed really. When I first got into using a coiled banetton I liked the pattern but I think the linen lined baskets from sfbi give the dough a better slightly dryer skin. Slashing seems to be easier. As hansjoakim said further down in this thread, the tiny amounts are cumbersome if you stay true to the formula. I don't have a scale to measure amounts smaller that 1 gram and I don't trust the measurement of very small amounts added by sprinkling. I suppose the easiest way to do this repeatedly would be to buy a pocket scale that measures tenths of a gram and convert the small amounts to volume measurements. It would be much easier to scoop 1/4 tsp than try to weigh it every time, if I knew the weight. Nice recovery anyway David. And I like the color you baked to way more than Gerard's pale loaves. I wonder what the deal is with that? He is baking in a large WFO so you would think it would be plenty hot. All the photos of his bread show the same light colored crust. For the crumb to be done it must be baked at a low temperature, don't you think? I'm tempted to try duplicating the color once to see what the result is. Apparently he gets raves on the aroma of the bread. My experience with the linen-lined banetons vs. the coiled reed brotfomen parallels yours. Unfortunately, I don't have any banetons for bâtards. Also, I'm working on my shaping technique for those long loaves with tapered ends that need to proof en couche. Re. the plural of "miche:" It is "miches," but, in French, they are pronounced the same. The final "s" is silent. Re. crust color: I've thought about that too. In MC's interview, Rubaud said he doesn't like ears on his loaves. He thinks the darker crust detracts from the flavor of the bread. We talk about the crust contributing some very high percentage of a bread's flavor, but is that because most white breads don't have that much flavor anyway? When you make Rubaud's bread, there is so much complexity and real taste in the crumb, it's a different ball game. My hypothesis is that Rubaud has put his effort into developing the crumb flavor and doesn't want the crust to distract one from that. I'm going to bake my next batch at a lower temperature (450º, as prescribed) too. Let's compare notes. In another thread, hansjoakim and I had an exchange regarding the relationship between adequate dough fermentation and the amount of dough expansion. His observation was that levain dough expands much less than yeasted dough, and if you let a levain-raised dough double in volume during bulk fermentation, it would be over-fermented. The dough for my Rubaud pain au levain was expanded exactly 25% when I divided and shaped it. And look at the crumb! You'll have to take my word regarding the flavor. Hansjoakim's assertion is clearly supported by this bake. Tremendous spring, David, going by that gorgeous crumb shot. Your and Shiao-Ping's descriptions of the flavour profile has me intrigued and salivating. Next loaf on the list for me, too. The crumb looks perfect - creamy and very well developed! I'm particularly weak for these mixed flour levains, and this looks brilliant, David! I measured the 0.5 gm quantities by estimating. My scale just measures to 1 gm. I did make sure the the total amount of non-AP flours was accurate (to 1 gm). As I indicated, next time I will weigh out the total flour mix and apportion the mix for each build. I am so happy that the recipe worked out so well.. 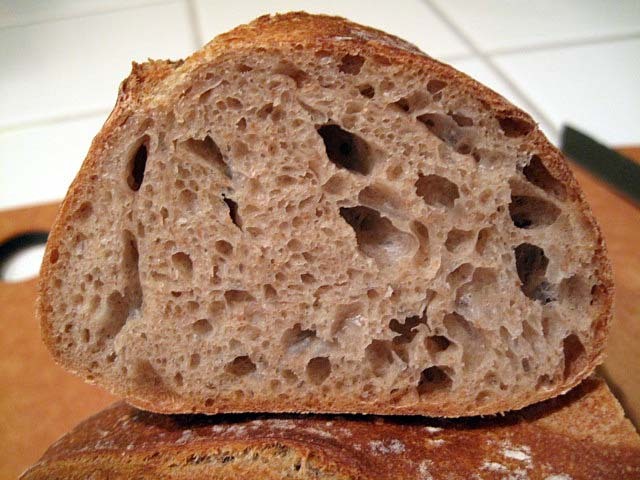 Your crumb looks absolutely lovely and the taste is very evocative of the one I got with Gérard's levain. Now you know why I have fallen so hard for his method. Gérard never flours his couches, only the bottom of the breads themselves (he uses a hi-extraction organic flour for that specific purpose). Re: levain. I understand that the proportions have to be greatly reduced for home-baking but it is kind of a trade-in because, according to G you don't get the benefit of a mass effect under 100g. So when I make his bread, I only do a one-step levain. It would be too much waste otherwise. The bread still comes out tasting great and with a good crumb (I showed the pics to Gérard and he was very happy with the result I got). Of course my kitchen is about 14 degrees F cooler than his bakery and so the fermentation is much longer. Maybe the longer fermentation makes up for the two steps that I skip. I'd be curious to see what kind of results you would get if you did a one-step levain as well. I wonder if you would be kind enough to write out how you do it? I have wanted to make this bread because of the positive comments, but I was put off by the multiple steps. Thanks for your kind words and for your splendid interviews and Q&A on Farine.com. I wonder if my dough consistency was wetter than G's. I have no experience with fresh-ground flours. Is their absorption of water greater than "old" flour? I may try dusting the loaf bottoms in any case, to see if that works better. I may bake this again with a single levain build, just to see the difference. I made some Pain au levain that is all white flour and white starter turned out great, I'ts one of those breads that I will be making all the time. Gérard Rubaud formula in a single table, FYI. I am thinking about making a flour mix for Rubaud's pain au levain incorporating all the flour needed for the builds and the final dough. I'm also thinking about making it with a single levain build, as suggested by MC. To assist myself, I built this table. I thought others might find it useful, so I'm sharing it. This table provides the ingredient amounts for each of the three levain builds and the final dough for Gérard Rubaud's pain au levain, scaled to produce 962 gms of dough (assuming 78% hydration and 1% salt). Regardless of how many levain builds you make, you could pre-mix the flours needed according to the "Grand Total" row, then use the quantities of that mix for each build according to the “Levain x” rows. If you want to make this bread using a single levain build, just use the quantities in the “Levain Total” row. That is, mix 72 gms of the flour mix with 54 gms of ripe levain and 40 gms of water. These quantities can be multiplied by any amount you choose to make a larger or smaller batch of dough, of course. Don't forget the salt in the final dough! This table also makes it easy to do other interesting calculations. For example, I see that 72/532 x 100 = 13.5% of the flour is pre-fermented. Let me know what you think. If you catch any errors, please let me know. I took a look at your table and was surprised not to see salt in the levain. Like Professor Calvel and other traditional French master bakers, Gérard always puts a tiny bit of salt in his levain builds. Consequently when I refresh my levain, I use 100g culture, 130g water, 140g AP flour and 60g freshly milled whole grain mix (60% wheat, 30% spelt, 10% rye), to which I add 0.5g salt. Therefore, all things being otherwise equal, my levain probably ferments more slowly than yours. However I don't put salt in my liquid levain. I tried at one point but I didn't like the result (loss of flavor). It is mind-boggling actually as a higher % of water means a more active fermentation and I would have thought that salt was particularly useful for very wet levains but it wasn't the case in my experience. I had to throw the levain away and roll out the backup. Anyway, given that I don't sift any of the bran out, I have to go to an 85% hydration rate to get a dough as soft as his (and he goes for 78 to 82% most of the time). I've never added salt to my levain. I didn't know it was that commonly done. My impression is that its function is to slow down fermentation, not particularly to benefit flavor, but to control the timing when the ambient temperature is warm. This time of year, that's not a problem. Are there other reasons for adding salt to levain? Is the culture refreshment you described for your stock culture, or is it that mix specific for Rubaud's pain au levain? I've been using a 70:20:10 (AP:WW:Rye) mix to feed my starter for a couple years. A feeding is 1:3:4 (starter:water:flour mix). How much I refresh depends on my baking plans. Spelt and I are just getting acquainted. I really don't have a feeling for it's flavor or influence on dough consistency yet. Bran's nutritional role is largely as a source of insoluble fiber and minerals, as I understand it. I don't know about differences among grains' bran, except that wheat bran is insoluble and oat bran is soluble. I don't know where rye or spelt fit in. I have mixed up the flours for another batch of Rubaud's pain au levain. I'm going to follow your suggestion to do a single levain build, which I will ferment overnight. I will mix the "Levain Total" starter, water and flour mix. Is that what you did when you made this bread with a single build? ...to his levain year-round. He says it is essential to control its development as well as the aromas. I looked it up in his library when I was at the bakery and here is what I found (the following is an excerpt from one of my posts on Farine). Calvel recommends using salt in the levain in Le Goût du pain (The Taste of Bread) (p. 61 in the French edition. I was unable to get the English translation from my local library, so I can't give you the page number in English. Sorry about that...). "Pourquoi ajoute-t-on toujours un peu de sel au rafraîchi ? Parallèlement aux levures sauvages, l'acidité se développe, ainsi que certains enzymes appelées protéases. Ces enzymes ont une action néfaste sur le gluten et le liquéfient, ce qui rend la pâte molle et très collante ; le sel ajouté au rafaîchi bloque l'activité des protéases". (Why add salt to each feeding? Parallel to wild yeast, acidity develops [in the levain] as well as some enzymes, called proteases. These enzymes have a harmful effect on gluten which they tend to liquefy, making dough slack and very sticky; salt blocks protease activity) (my translation). Re: refreshment. I should have been more specific. Yes, it is what I feed my stock culture, twice a day in this season. I don't know yet how it will play out in the summer. Re: spelt. I love the flavor which contributes very delicate aromas to my bread now that I use G's levain. It also gives the crust a more yellowish tinge. Like Eric, I have been surprised at first by the blondish color of Rubaud's loaves. But my bread came out blonder than usual as well (although not as blonde as his) when I started using his grain combination. The reason mine was still darker and more red is that my oven was set at 480 F when I put the bread in. He bakes at 450F. Working with spelt, you will find that it is quite a "thirsty" flour. At SFBI, I was told some bakers like to add a bit of honey to a whole spelt dough to help with the shelf life as spelt bread does dry out faster. I have always thought of protease activity being a significant factor only with very long fermentations, for example, when the dough is retarded in bulk. On reflection, I do find my levain being much more relaxed than expected after fermentation for 12 hours or so. How much difference does this make in the dough consistency with a levain inoculation that is 12% of the final dough weight? i'll have to remember to try adding salt to the levain builds next time. I rarely have time to bake, except on weekends, so my starter is refrigerated during the week. I generally activate it with a feeding before mixing the levain for the next breads. I imagine adding salt with the feeding before refrigeration would be helpful in prolonging the health of the culture. Hmmm ... So if I feed the starter with 80 gms of flour, I would add 1% salt = 0.8 gms? ...which you'll find here and I actually use much less salt than that. For 200g of combined flours, I use .50g salt. I'm not clear regarding what your table represents. Are A1, A2 and A3 sequential builds, or are they alternative levains using differing flour mixes? ...the formula G uses to build a levain from scratch and A1, A2, etc. are sequential builds. The indications for the last feeding can be used for maintening the levain once it is operational. In my case however, I adjusted the hydration a bit higher (65%) to accommodate my wrists. Leaping in for a second here, if I may - I believe one of the reasons salt is added to levain, is to reign in potentially excessive proteolytic activity. Beautiful loaves, btw, David. Love the crumb! I copied your last table into word and added a row for salt at 10 grams. I'm going to start a batch today with a single stage and use a small portion of the salt in the levain build. I'm going to bake at 450F and check the internal temperature when the color is blond. If it's near 200F, I'll pull it at that time. Looking forward to seeing your results, Eric. ...I just recalled. Yes, indeed, Gérard's bread results from a lot of attention paid to the smallest details. To wit, one day I was at the bakery and cut a slice of bread for myself and found it salty. I told Gérard that his bread was a bit saltier than usual and that I wondered why. He was aware of it: he had been interrupted as he was taking the loaves out of the oven with the result that some of them baked longer than usual. The longer the bake, the more water evaporates and the higher the concentration of salt. By the same token, his bread is always saltier in the days that follow the baking than on the day it comes out of the oven. Another reason why he pulls his breads out of the oven when he does. Gérard is in a rather unique situation inasmuch as several of his customers are true bread fans and don't hesitate to call him up to ask questions when anything changes in the aromas. He loves getting such feedback. That's why it's such a challenge to answer beginning bakers' questions about why their breads do this or that, to their frustration. The possibilities are always many. I hope Gérard is enjoying how much pleasure baking from his formula is providing to so many of us. Please convey my personal appreciation to him for his generosity in sharing his knowledge and my admiration for his bread. And thanks again to you for making this wonderful formula available to us! ...as well as at the health benefits of levain, you may want to take a look at a synopsis of the current research on the subject, put together by Robert Low, Professor of Microphysiology and Biophysics at the University of Vermont. Bob sent me his paper and I put a link to it in this post. The topic has been of interest to him for the longest time as he has been a serious home baker most of his adult life and he bakes with levain himself. If there are any questions, he said he'd be available to answer them. Maybe the easiest would be to put them to him in a comment to the post on Farine. ...loves it when other people bring the same passion as he does to baking with pure levain. He'll be most pleased to hear about your work. Thank you! Do you combine the amounts for the multiple builds to do a single build? Could you be specific for those of us who are wondering? Patricia, actually I go by the total amount of levain I am going to need in the final dough and do the build accordingly using the formula. Sometimes there'll be enough leftover after the feeding the levain-chef (the mother levain) for me to bake with. Sometimes I have to plan for a specific amount. As I never make big batches (rarely do I go over 3 or 4 lbs of dough since my oven is rather small), quite often there is no difference between a refreshment and a build. I don't know if this makes sense to you? If you're talking about using the refreshment as the levain, as in the 1-2-3 bread. My partner has some kidney impairment, which necessitates her being on a low-sodium diet - that was one of the factors that led to my baking pizzas and bread (every cloud has a silver lining, indeed!). I decided from the outset to support her by sticking to the same diet. I figured lowering my salt intake wouldn't hurt, either. Well, it did for a while. I do the cooking, and am used to tweaking the seasoning to bring out the best in the flavours. I felt very hamstrung when I first began low-salt cooking, but as time went on I found I became far more sensitised to salt. Now, many commerical offerings are way too salty for me - including what was once my favourite local sourdough bread. I generally halve the salt in bread and pizza recipes, and although this is going to sound less than credible to many, I find the flavours improved! The 'true' flavour of the wheat and other grains comes to the fore if you do not cloud them with salt. Using 1/2 quantities of salt is a long way from NO salt, however - that is too bland a prospect to contemplate. Anyway, I was interested to note MC's comment on using less salt in her bread, and her observation that she found GR's bread too salty on occasion. My strong suspicions are that the traditional 2% of salt is too much to a palate that is not de-sensitised to salt through excessive intake (and let's face it, most of us probably do habitually have too much salt). The big surprise for me has been that what started off as a somewhat resented medically-based reduction in salt has now ended up in a new appreciation of flavour! I can only speak for myself, but I think it's worth trying reducing salt in your bread rather than assuming the 2% 'rule' to be ever-applicable. I used to think salt content in all food was determined by some sort of absolute flavour scale. Celeb chefs judging aspiring cooks on TV cooking competition shows, for example, often screw their faces up on tasting and declare "not enough salt" - this is invalid, although you'd never convince them of that. The fact is - and I can now state this through experience - the quality of saltiness, of 'too much' or 'too little' or 'just right', is subjective. I'm glad you brought this up. I'm trying to remember where I read about this. I think the first time was in Julia Child's Learning to cook French from about 30 years ago. The assertion was that the longer a professional chef is making decisions about how much salt to add in a meal, the more he will require to find the "right" level. As Ross said we become desensitized to the taste over the years. I have eaten in some very nice restaurants with old chefs that made soups that were not edible due to the salt. I would be interesting to slowly reduce the salt from the usual 2% down to a lower number over a period of time. I know I over salt everything and a reduction would be good for blood pressure reduction if nothing else. Thanks for this post Ross. Thanks for your comments, Eric, and for the reminder on the tendency of chefs to over-salt due to their becoming de-sensitised to 'saltiness' over the years. I have heard the same, although I haven't actually read Julia Childs (loved the recent movie, Julie and Julia). Would be most interested in your findings on bread flavour if you do try reducing your bread salt content. BTW, I think it's a big mistake - and just plain unhealthy - for the home cook to model themselves on celeb chefs. Pro chefs have a different agenda from home cooks. They are running commercial operations and need to stand out from the crowd to ensure a healthy bottom line (rather than healthy customers!). They'll do anything to add big flavour to their food. How many times do you watch a TV chef talking about adding "a little olive oil" and throwing in half a cup, or "a little butter" and knifing 3 ounces off the block? I see this as cheating, in a way. What doesn't taste great with whacking great amounts of butter added to it? More often with salt, though, rather than adding a lot at one time, they chuck in a bit here and a bit there as the dish progresses - by the time it's finished it really adds up. A trick I use in maintaining a low salt diet is to add any salt by sprinkling it directly over the meal once it's served, rather than during cooking. You can taste it more easily that way and can get away with far less than, say, in a risotto where traditionally you add it bit by bit all the way through (supposedly because rice 'absorbs' it). My very health-conscious wife convinced me decades ago to decrease how much I salted food. My experience has been that my subjective judgement of saltiness has changed enormously. I regularly find restaurant food too salty, especially soups. When baking bread, I generally follow the formula. I don't find my bread too salty, and my wife, who is much more salt-sensitive than I, has never complained of this. David, I have no doubt your breads are beautifully flavoursome. You know that I am a fan of yours! However, I wonder if you would consider just trying lowering your dough salt content a little below the accepted standard proportion - just once, as an experiment - and reporting back on how the flavour of the bread is affected? We're all on a quest for better bread, no? Hence all the different techniques and dough mixes. It seems to me that the 2% salt rule is rarely questioned...and I'm making the perhaps radical assertion that less salt - to a point - can actually enhance the flavour of bread, health considerations aside. I should make it clear, too, that 'm not talking about reducing the quality of perceived 'saltiness' in bread - nor am I suggesting that all bread with 2% salt content actually tastes salty as such (although it probably does to me, now). I'm putting forward the proposition that reducing salt content below the standard 2% can actually reveal flavours in the wheat and other grains that have been previously submerged and undetectable. As one of my most admired bakers, I'd be most interested in your findings (or those of anyone prepared to give this a go). I'm already convinced, but I'm curious as to whether my palate has become so sensitive to salt through cutting it down to the extent I have that my truth is mine alone. (Actually, I know that's not quite the case, at least - I've had feedback that I thought was a bit over the top from friends to whom I've given bread ...perhaps that's because any decent home-baked SD is so damned nice, perhaps because they were being over-kind...and perhaps because the bread really does taste very good - it was probably one of yours BTW!). ... of a recent blog post by Michael Ruhlman: Salt. Is it good or bad? I think Ruhlman's basic point regarding salt and gastronomy (as opposed to the health issues) is that salt can make tasteless food more appealing. I agree with that. We have the good forture to live where there are organically grown fresh fruits and vegatables available from local farmers year around. About the only processed foods we consume are canned tomatoes in the winter. When we think about possibly re-locating at some point in the future, the loss of access to such wonderful produce is one of the most significant negative considerations. As Ruhlman points out, not everyone is so fortunate. can inhance or take away from a flavor and dull the taste buds IMHO..I think enjoying unsalted butter for it's wonderful flavor has been my best example. I'm with you on unsalted butter, Sylvia. I 'discovered' that (along with just how good and diverse bread can be), during a year in Germany in the mid-80s. The Germans use only unsalted butter as a spread - those I stayed with, at least. I hadn't realised until then how much better it tastes than salted...especially the lovely Scandinavian butter that is cheaply available there. Whether salt enhances or detracts from/overwhelms flavour is all about proportion used, the types of food involved, and one's palate (and these days, the extent to which it is desensitized to salt - or not). Lots of variables there, and lots of room for tweaking to individual taste. I moved to the states 20 years ago from Ukraine, and that's the day we discovered salted butter, till this day I cant understand why people use it, I never buy it and love to enjoy a slice of bread with some nice sweet creame butter that brings the flavour of the bread.